You have questions about organ and tissue donation – we have answers. Click on any question below for more information. Anyone can register to become a donor regardless of age or medical history. Your medical condition at the time of death determines what organs and tissues you can donate. Register through the Kansas Organ & Tissue Donor Registry today. If you are 17 or younger, you may join the donor registry, but your parents or legal guardians will remain responsible for making the final decision. The registry will automatically update your status when you turn 18. How can I become an organ, eye and tissue donor? Say “yes” at the DMV when asked if you wish to be an organ and tissue donor. Complete and mail in your registration form. Call 1-888-744-4531 (toll-free) to request the form. Include your decision in an advance healthcare directive, will or living will. Sign and carry a donor card or other signed record. How do I make my decision known? Inform your family now, so it will not be a surprise to them when the time comes. They will be notified at the time of your death that your decision to donate is being honored. In the absence of a donor designation, or if you are under age 18 and not an emancipated youth, your family will make decisions regarding donation. It is also possible to document your authorization in a legal document such as an advance healthcare directive or living will. However, if your family is unaware of your legal documentation, they may be unable to carry out your wish. You may also choose to speak with your faith leader, friends and physician about your wish to be a donor. All major religions support organ, eye and tissue donation as a final act of love and generosity. They encourage all members to support donation as a way of helping others. Can I be a donor without being in the state registry? Yes. Talking to your family about your wishes and joining the registry is the best action to take, but enrollment in the state registry is not required for donation. If you decide to be a donor, but prefer not to join the registry, it is important to tell your family about your decision. Can I sign up even if I'm not a Kansas resident? If you live in or travel to Kansas, you are encouraged to sign up for the Kansas state registry and your home state’s registry. Visit Donate Life America for information on how to enroll in your state. Will my decision to donate affect the quality of my medical care? No. Organ, eye and tissue recovery takes place only after all efforts to save your life have been exhausted and death is legally declared. The doctors working to save your life are entirely separate from the medical team involved in recovering organs and tissues after death. What is an advance directive for healthcare choices? An advance healthcare directive is a legal document that outlines your decisions concerning medical care at or near the time of your death. It can also provide your authorization for donation, provided you have outlined your decision to donate in the document. Typically, an advance healthcare directive prohibits the use of intensive care interventions. If you plan to be a vital organ and tissue donor, however, the document should specify that intensive care interventions are authorized for the purpose of organ and tissue donation. An advance healthcare directive is not required to be a donor. Brain death results from severe, irreversible injury in which critical areas of the brain are damaged to the extent that they no longer function, and the person cannot sustain his or her own life. Vital body functions may be sustained in an intensive care unit for a short period of time, so that blood continues to circulate to the vital organs long enough to facilitate organ donation. People who experience brain death can also donate tissue. Cardiac death is when the heart stops functioning and breathing stops. All organs and tissue in the body die from a lack of oxygen. People who experience cardiac death can donate tissue after their death. What medical conditions prohibit donation? Each potential donor is evaluated for conditions or illnesses that may put a transplant recipient at risk. What happens to my donated organs and tissue? Patients receive organs or tissue based on their blood and tissue types, length of time on the waiting list, severity of illness and other medical criteria, and geographic location to the donor. Patients receive tissues based on medical condition and need. A national allocation system ensures the fair distribution of organs in the United States. Social and financial data are not considered during the allocation process. Race, gender, age, ethnicity, income, or celebrity status do not determine who receives an organ or tissue transplant. Donated organs, eyes and tissues are given to people who need them the most. Typically, at the local level first, then regional, and finally all over the country. Under certain circumstances, organs, eyes and tissues may be sent out of the country to help patients in need. Buying and selling organs is against the law. Can I give an organ to a specific person? You can specify an individual to receive a donated organ. If the recipient is a suitable match, they can receive the transplant as a gift. You cannot specify a donation on the basis of age, gender, race or ethnicity. Doing so would violate the fair allocation system. If you have questions about directed donation, please contact Midwest Transplant Network, Saving Sight or Kansas Eye Bank and Cornea Research Center. Can organs be given to people of a different race or gender? Yes. However, organ size is critical to match a donor heart, lung or liver with a recipient and can be affected by gender. Due to the importance of tissue matching, genetic makeup can be a factor when matching kidney or pancreas donors with recipients. For example, the kidney of an individual of Asian descent may match better with a fellow Asian rather than someone of a different race. That said, transplants between different races and genders can and do happen with great success when matches are available. Does the Kansas Organ and Tissue Donor Registry allow me to sign up as a marrow or living donor? No. This registry is only for organ, eye and tissue donation after death. Does the Kansas Organ and Tissue Donor Registry allow me to donate my whole body to science? No. Signing up in the Kansas Organ and Tissue Donor Registry does not grant permission for your body to be donated to medical schools. Organ and tissue donation for transplant or research is not the same as willed body donation. Willed whole body programs are usually associated with teaching hospitals at major universities, and arrangements must be made in advance directly with the institutions. Note: If you choose to consent to whole body donation, you will be unable to donate your organs or tissues for transplant. Can my body be donated to science after donating my organs and tissue? Yes, but each academic institution has its own guidelines for accepting body donations. 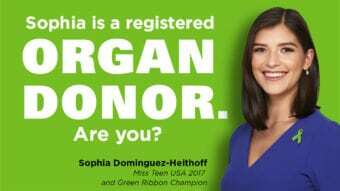 Not all schools and universities will accept organ and tissue donors. If you’re interested in donating your body, we recommend contacting the school you wish to support for information about their organ and tissue donation policies, and to pre-arrange the donation of your body for the advancement of science if desired. How quickly must organs be recovered? Organs must be recovered as soon as possible after death is legally declared. Tissue and eye donation can be completed up to 24 hours after death. Do I have to tell my family? No. Your family will be notified of your decision to donate at the time of your death. However, you are strongly encouraged to inform your family now so it will not be a surprise at a very difficult time. Will donation affect memorial or funeral arrangements? No. Donation does not typically delay funeral or memorial services, nor does it prevent an open-casket funeral. Can my relatives make the donation decision? If you have recorded your decision to be an organ and tissue donor and have not revoked that decision, then your relatives cannot make the decision for you. In the absence of a donor designation, or you are under 18 and not an emancipated minor, the law provides a priority list of who is responsible for making the final donation decision.